High quality musicianship is rarely in short supply, especially in Western North Carolina. That fact –coupled with the presence of several top-notch recording studios in the region – means that the bar is set quite high for a new album release. This is especially true in the crowded field of Americana and its related genres and subgenres. In the end, it takes something extra-special for an album to stand out in a sea of finely-crafted, acoustic-based albums. In the case of Zoe and Cloyd, that special something is the pair’s vocal prowess. Natalya Zoe Weinstein and John Cloyd Miller were formerly two-thirds of popular Americana trio Red June; those who enjoyed that group’s seemingly effortless vocal harmonies and enchanting melodies should be every bit as pleased with Eyes Brand New, the second album from Zoe and Cloyd. No doubt the duo’s vocal blend is anything but effortless; it’s clear that a great deal of work has gone into achieving the seamless melding of the two voices. But the end result has a wholly organic ambiance to it, one that makes it feel like the most natural thing in the world. Even when Miller takes a solo vocal – as on most of “Jewel of the Caspian Sea” – his voice shimmers and shines like a mountain stream. Weinstein takes her well-deserved solo vocal turn several times on Eyes Brand New; one highlight is “You Light My Way,” a delightful yet understated song of love. If something can be simple and unadorned as well as transcendent all at once, such a thing might be the Weinstein’s clear, vibrato-free voice. But to focus wholly on Zoe and Cloyd’s superb vocals is to overlook the record’s other winning qualities. Both in terms of lyrics and instrumentation, Eyes Brand New is a supremely well-put-together collection of songs. 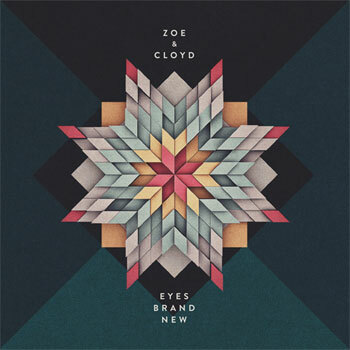 Compared to Red June, the music that Zoe and Cloyd create is perhaps a bit less pop-oriented; there are fewer concessions to popular convention. The winning melody of “Running on Empty” (an original tune, not a Jackson Browne cover) would be right at home on a broadcast of A Prairie Home Companion; while a look at the duo’s concert itinerary shows engagements primarily in and around WNC, don’t be surprised if Zoe and Cloyd score higher profile dates on a wider scale in the near future.